Your furniture is exposed to daily use, abuse spills and even more if you live with children and pets. Professional upholstery cleaning is very important. 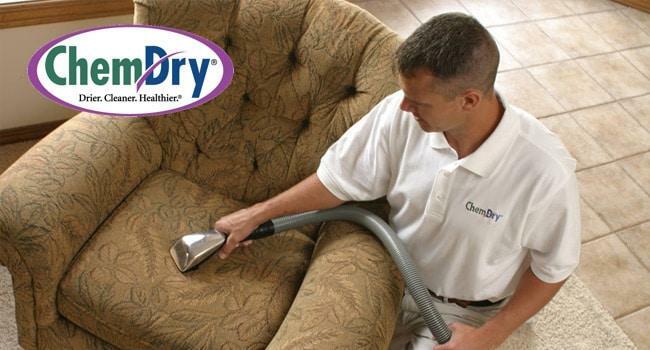 Chem-Dry upholstery cleaning is very similar to our carpet cleaning service and features all-natural, eco-friendly solutions and low moisture. Champion Chem-Dry technicians first vacuum your furniture and your upholstery so that all the visible dirt is extracted and gone. Next, your furniture will be lightly misted with The Natural, our cleaning solution that is chemical- and soap-free and safe for children and pets. The Natural performs similar to club soda on a fabric stain due to its carbonation. HCE is the process of using heated suction in order to evaporate and expel bacteria and germs and dirt from the furniture. It removes most of The Natural solution as well so your furniture dries quickly. The standard upholstery cleaning process outlined here is about 10-15 minutes on average and the furniture dries within a couple of hours after that. Our service dries faster than average because of the low-moisture methods but factors such as soil conditions and humidity can cause the process to be a bit slower at times. If you are able to turn on your air conditioner or other ventilation it can expedite the drying process. If your furniture was made in the last 10 years or so there is a good chance it included a manufacturer’s protectant or stain guard. Unfortunately, that diminishes over time and is gone after a year or two. That’s why we offer our own upholstery protectant. We apply it to your furniture once cleaning is complete to create a new guard or shield that will repel spills and liquids and help prevent permanent stains. Champion Chem-Dry offers protectant for your carpet too! Be sure to ask your technician if interested. Go one step further and request Chem-Dry sanitizer be applied to your upholstery too. Our sanitizer kills bacteria on furniture and in the air in your home. In fact, an application of sanitizer combined with upholstery cleaning from Chem-Dry will remove 89.1% of airborne bacteria for a truly healthy clean! Healthy carpet cleaning for your home features chemical-free solutions and first-class equipment. Professional area rug cleaning and Oriental rug cleaning restores the beauty of the rugs in your home. Tile cleaning, stone and grout cleaning eliminates bacteria and restores the shine of your floors. Champion Chem-Dry offers commercial carpet cleaning for local businesses throughout Tampa, FL. Don’t trust DIY stain removal tips online – Trust our professional stain removal techniques. Innovative process for removing pet urine odors and halting the damage of pet urine stains. Granite countertop renewal service features cleaning, polishing and sealing for countertops. ”Like” us on Facebook: Find local news and events, pet care tips, recipes and online coupons! Do you have feedback on your service from Champion Chem-Dry? Please write about your experience with us here.